One Night @ The Airport - A Rose Is A Rose Is A Rose! These questions made me go Aww and Argghh at the same time. These questions were asked by KG and my parents for I was taking a connecting flight from Pune to Jaipur via Delhi. They were overly concerned as I was landing at Delhi airport at 1 am and taking the next flight at 5.15 am. So, that would mean, being at the airport for about 4 hours which are certainly unearthly hours. While they worried and fretted, I was cool. I had 2 paperbacks in my back, 3 ebooks on my phone, a laptop with datacard to keep me busy during the night and a warm stole in case tiredness and sleep engulfed me. Having slept during the 2 hour flight from Pune to Delhi, I was fresh and alert as I walked on the long travellator at the swanky Indira Gandhi International Airport T3 Terminal. It was 1.30 am. A ‘Aha’ escaped my lips and some invisible strings pulled me in its direction. I ditched the travellator and walked with a purpose. There were big brands all around! (What were you thinking?) When I see shopping stores, there’s no stopping me. No, I don’t buy anything and everything in sight, I like to call myself a sensible shopper. But what I enjoy the most about shopping is the looking at the display at the stores, checking out new items and chatting with sales people. Of course, this I can do only when I am alone. KG has no patience for all this admiring stuff and not buying it. Aah! But I digressed. I checked out some dresses and tops at Marks & Spencer, looked at the phone and laptop accessories and grilled a sales guy about Windows phones at Chroma. I also browsed through the various books and products of The Art of Living- The Divine Shop. Was not aware of their ayurvedic cosmetics, food and wellness products and walked past a lot of eateries and bar lounges, prayer room and other shops. The next stop was Costa Coffee. Handling coffee in one hand and a plate of date and fig cake on another, a big bag on one shoulder and a heavy laptop bag on another, I was a sight. I looked around and saw plush chairs outside Starbucks counter. I cursed myself for not seeing Starbucks a few minutes earlier. Would have loved to see how they’d misspell my name and would they write my name on the cup even if I was the only customer then? Anyways, as I was digging into my cake, the guy at the Starbucks counter told me, “Outside food is not allowed!”. I smiled and told him, just this time and he agreed. I looked around and wondered about the sales guys and girls working during the night shift. Some were busy on phones, some working on the PCs, may be making sales or stock reports, some were sitting and chatting in groups of twos or threes and some were simply dozing off. Sufficiently charged with a good dose of caffeine, I moved further ahead and yet another wonderful sight came in front of me. It was Relay, the book store. With a spring in my step, I walked towards this store. And my grey cells reminded me of a long pending dream. I love doing book spine poetry, you must have seen a few of them on this blog. For the uninitiated, a book spine poetry is arranging book titles to make a poem or a story. Since I started doing the book spine poetry, I wished I could create one in a book store as the book titles there simply outnumber the ones in my library cupboard. (Oh, I do have a pretty decent collection of books, though!) But, this dream never materialized for (1) I usually go to a book store for buying a last minute gift for someone (2) It is a time consuming process and in a busy store during the day time, if I went about looking at the titles in all sections and made piles of books, I am sure the store guys would call the security to throw me out. Ok, that’s an exaggeration, but I am sure, they’d not appreciate it. An empty book store with a sleepy sales guy was a perfect opportunity to make my dream come true. As I gathered books and arranged them in a pile, added or removed a book, the sales guy at the counter woke up from his slumber and looked at me curiously. I explained and he liked the idea and read my incomplete story with book spines aloud. He looked around to add his inputs but gave up after a minute and went back to fiddling with his phone. After craning my neck at a weird angle to read the book titles for half an hour or so, I came up with this book spine poetry. With a dream fulfilled, it was time to buy a book from the store. 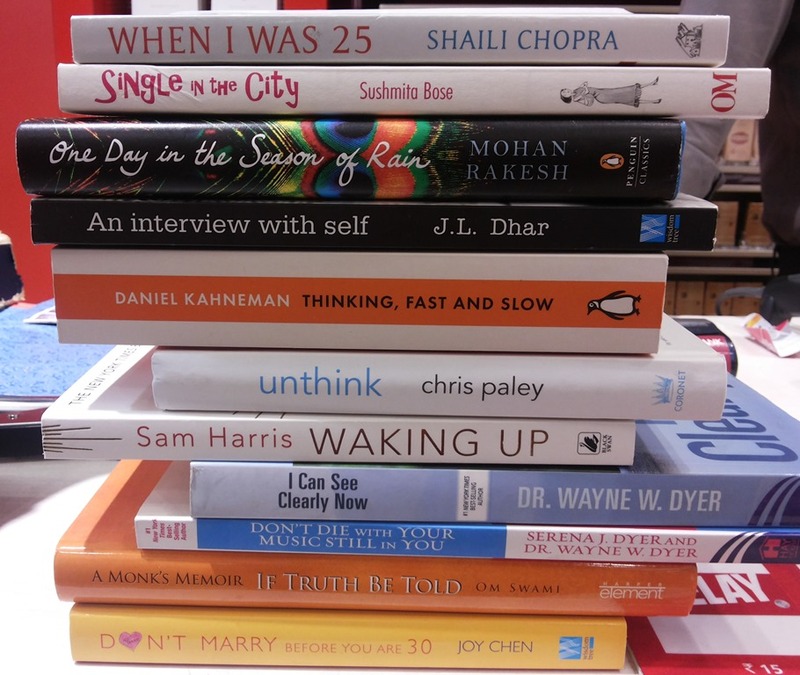 After shopping online with decent discounts, buying a book at its MRP gave me heartburn. But had to buy something. So, I bought Mrs Funnybones by Twinkle Khanna. It was 3.30 am! I had window shopped for about 2 hours! The boarding gates for my flight would have opened at 4. 30 am, so I thought of writing a blog post. But everything can’t go right, so neither the free wi-fi at the airport worked nor did my datacard. I had no other option but to read. Mrs Funnybones joined me and her company was fun and funny. As she regaled me with her stories, the travellator near me came to life. And with it came the clear, soft and smooth voice on the IVRS, which instructed repeatedly one and all to “Please hold the hand brake and mind your step. Kripya hand brake ko pakade hue savdhani se pair rakhiye.” This monologue played on a loop without a break and when it did stop after a while, seemed like an eternity though, I was chanting the same message in my head. Gosh! Soon, it was time to board the plane. And needless to say that I dozed off immediately after buckling my seat belt and woke up only when the aircraft landed with a thud at Jaipur airport. That was indeed an eventful, exciting and an enjoyable experience of one night @ the airport! Ha that was some night. I enjoyed your spine poetry. It is something else to be up late at night and watch the world slowly come to life. You know even I hate buying books at MRP now. Enjoyed the post! Thanks, Rachna, glad you enjoyed the post and spine poetry too. Shilpa this an interesting story of midnight encounters. It can be a story fit for comedy movie. Thanks Shantala. So, when are you creating a story with your book spines? Loved your spine poetry and enjoyed your night at the airport. I have spent many nights at many airports and I love browsing and hot chocolating and people watching and plane watching and shopping. Oh, yes, watching people is a great way to pass time and is an enjoyable experience too. Thanks Suzy! Made an enjoyable read, Shilpa! I wish i had been with you through the night, just visualized and yes, i would have done the same. 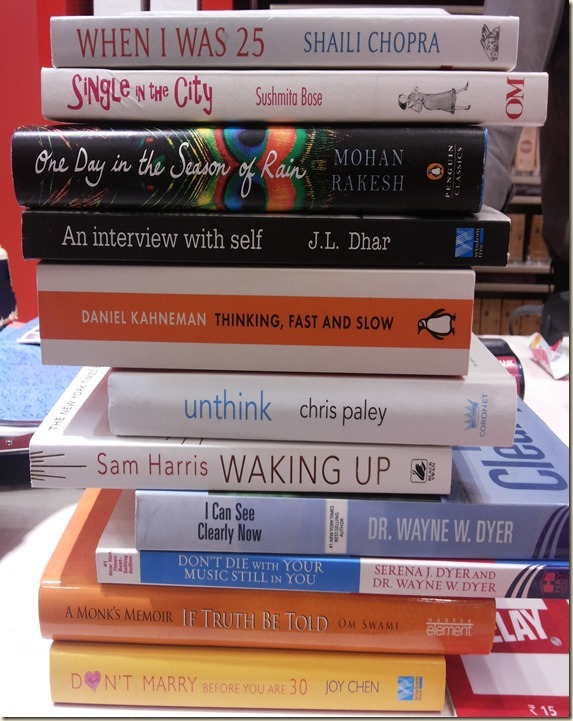 Spine poetry is something long pending, i wanted to do this eversince i saw it in your space long back. This is a good one that you have tried. Wow that’s an adventure alright. Spline poetry in a bookstore is a challenging task you managed to complete, irrespective of the time 🙂 In a similar situation, I think I’d have put my earphones and listened to an eBook. I am still not comfortable with an audio book. Well, have heard only one. Must explore this aspect of book reading! Thanks Rajesh! Thankfully T3 had lots to shop and look around. Otherwise, in smaller airports, it is usually books and observing people for me too. Shilpa, I loved your post. I read it twice 😛 I would have enjoyed doing the same at the airport. 😆 😆 some very good me time for you. I loved the spine poetry of course. The Delhi terminal is awesome and good you enjoyed yourself. Dis you say Pune? Ek phone call toh banta tha. That spine poetry was smart. but you had a good REST 🙂 doing what you love doing.. and costa coffee is welcome anytime of the day .. I know what you mean. Actually, I chose this flight so that I could meet a friend. Your work entails dealing with people day in and day out, so it is understandable. When and where are you taking your next vacation? Coming to India? I empathize with the sales guys. Working in a graveyard shift can be challenging. Mrs Funnybones is interesting and light read. Check it out. What a lovely account of your night at the airport. Reads like a lovely reality story. And the spine poem….. Simply wonderful. I loved your book spine poetry. Amazing. It sounds like you made good use of the wait. Glad you had an enjoyable stay at the airport. 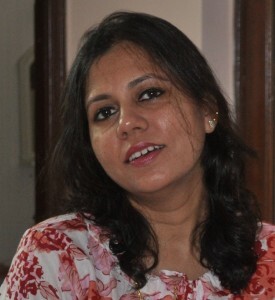 Looking forward to read your poetry with books, Mithila. Try one soon! Mumbai airport is great too, though Delhi T3 is my absolute favorite. I loved the title of your post shilpa..One Night @ the Airport, felt curious to know what happened and had a hearty laugh…your expressions are simply sweet.. .. some of things I can relate, specially going window shopping, checking the prices, but not buying and the spine poetry is something I am hearing for the first time… you are brilliant..and its a pleasure to read your posts. some night that was!! and your description, very novel-esque! and the spine poetry is too good!